One of my biggest mercury symptoms throughout my detox journey has been a chronic and system-wide case of yeast overgrowth. Not only does mercury interfere with the way in which the immune system kills off yeast cells, the chelator DMSA also has the side effect of depressing the body’s yeast killing abilities. That one-two punch of mercury plus regular DMSA use meant that for a couple of years, I had to be incredibly vigilant about making sure that yeast didn’t get out of control in my body. Even if symptoms appear as a skin rash or athelete’s foot, all yeast problems originate in the gut. Yeast or candida is an organism that is a normal part of the microflora in your gut. Problems only arise when the population of other more beneficial bacteria (like acidophilus found in yoghurt) decline and yeast takes over. Take a yeast-killing agent, whether it’s a prescription antifungal like diflucan or nystatin, or an over-the-counter supplement like oil of oregano or grapefruit seed extract. Take probiotics daily, either in the form of lactofermented foods like yoghurt or sauerkraut, or as probiotic capsules. Starve the yeast by depriving it of its favorite food–refined sugar. Yeast thrives on a diet high in refined sugar and carbs. If you are battling chronic yeast issues, the first step you must take is to radically cut down your intake of refined sugar. This means no candy, cake, sodas, cookies, or anything that has sugar as a significant ingredient. And switching to honey or agave nectar is not an option. Yeast feeds just as readily on these sweeteners. While you do this, it’s also a good idea to avoid all but freshly-squeezed fruit juices–especially commercially-made orange juice–and to limit your consumption of dried fruit. For some people, fresh fruit is also problematic, but luckily, it never gave me any trouble. If the above changes don’t control your symptoms, there are a few more options to try. Cut the Carbs: You can take the extra step of cutting your consumption of all carbohydrates. Switching your calorie intake to include more proteins and vegetables and healthy fats will deprive the yeast even more. This approach is easily implemented using the Atkins Diet. Try the Specific Carbohydrate Diet: This diet, outlined in the book Breaking the Vicious Cycle by Elaine Gottschall, defeats yeast by only allowing consumption of carbs that are readily absorbed in the gut so that nothing is left for the yeast to feed on. All grains are considered illegal on this diet. The Body Ecology Diet: This diet–described in The Body Ecology Diet by Donna Gates–has a strong focus on fermented foods that naturally build healthy flora in the gut. Like the SCD, this diet is gluten free, but some grains like millet are allowed. ← Mercury Detox Diets–Organic Only, Please! When you were sick, did you ever have trouble juicing things like kale? I had a really bad reaction to some pressed kale juice and am trying to figure out if I have an allergy or was having detox symptoms?? I do remember having a bad reaction to some vegetable juice at one point, I can’t remember what was in it, but at that time, I was having all kinds of odd little reactions to all kinds of foods, so it was pretty much par for the course. Hi Aine. Thanks for a great site. Whenever I kill yeast I get really depressed for two days. I still am not sure of what the yeast/mercury relationship is. Many people disagree. For me, when I kill yeast, I think it frees mercury, causing depression. I know Cutler doesn’t subscribe to that view though. What are your thoughts? I’ve learned to minimize it by tapering up any new yeast treatment over a number of days to the target dose so that they’re not all killed off at once. It’s always recommended to use a toxic-binding agent like chlorella, zeolithe or bentonite clay when killing yeast. They absorb the toxics and get them out of your body smoothly. Hope this helps. I have read that the body uses yeast as a place to store mercury so that less mercury is actually in the body cells, so when you kill the yeast, you do get a burst of mercury. Storing the mercury in yeast is a protective mechanism, so I have heard. 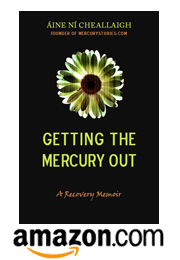 I am detoxing now and not partifcularly trying to get rid of yeast until I get rid of the mercury. I don’t know if that is the best way.